A unique concept pioneered by ULTRA WORLDWIDE™ in 2015, RESISTANCE™ has fast become known for producing some of the highest quality house and techno experiences around the world. First witnessed at ULTRA Buenos Aires in February 2015, receiving rapturous responses from fans and critics alike, the concept was then rolled out at the flagship ULTRA MUSIC FESTIVAL® Miami the very same year. Housed in the awe-inspiring, state-of-the-art ‘Afterburner’ stage, powered by UK production company Arcadia Spectacular, the RESISTANCE™ concept drew huge international attention and recognition in Miami in March 2015 and has since had custom productions on five continents. 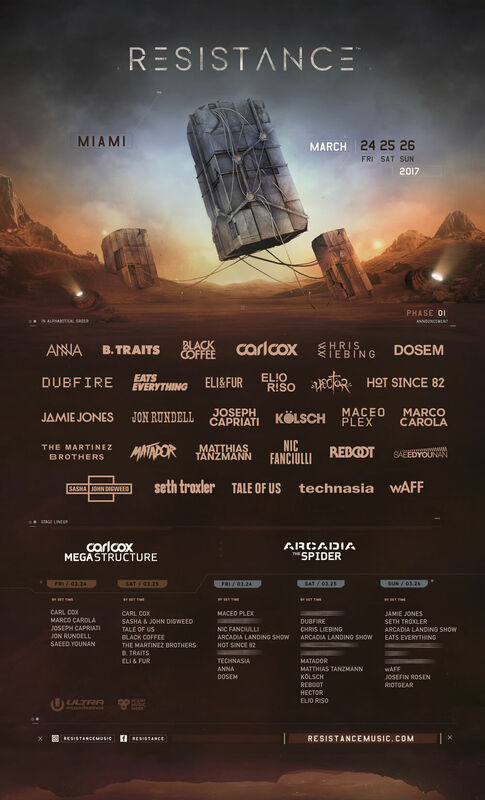 ULTRA MUSIC FESTIVAL® 2016 saw RESISTANCE™ team up with Arcadia Spectacular once again, this time for the highly anticipated North American debut of the legendary ‘SPIDER’ structure, complete with its own breathtaking ‘Arcadia Landing Show’. In only its second year, the burgeoning RESISTANCE™ concept has continued to expand. It is now in nine countries spanning five continents, with stages in Singapore, Bali, Tokyo, Brazil and three standalone events in Paraguay (Asunción), Peru (Lima) and Chile (Santiago).